After being drafted by the Boston Bruins, second overall in 2010 NHL Entry Draft, Bruins' forward Tyler Seguin did not get the amount of ice time he and most around the the league would have expected. In the 74 games he played during his rookie season, he averaged just 12:12 of ice time. Taylor Hall, the number one pick of that very same draft averaged almost 6 minutes more per game than Seguin. Seguin's statistical output may have been an arguing point for some more ice time. In his 74 games played, he scored 11 goals and totaled 22 points. This regular season performance did not persuade Bruins' coach, Claude Julien, to give Seguin the nod for ice time in the playoffs, resulting in Seguin not playing in the first two rounds of the Stanley Cup Playoffs. 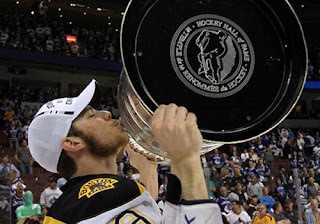 It was not until the Bruins suffered some injuries to their top forwards did Seguin get a shot at a playoff appearance. In the first two playoff games of his career he notched six points, after scoring several highlight reel goals. However, he saw a reduction in ice time in his final 11 games of the Stanley Cup Playoffs, where he only recorded one assist but had his presence felt when ever he was on the ice. Regardless of his average ice time per game, that ranked him 16th among rookie forwards in the league, he still got a championship ring and a day with the Stanley Cup. However, next season Seguin should become a nightly name on the Bruins' roster, along with an increase in his time on ice per game. It would not make sense to keep Seguin from gaining more experience and growing into one of the NHL's top scorers. Seguin should only progress with the more exposure he gets. On the other hand, holding Seguin back would more than likely hinder his development and Claude Julien would then be seen as the man behind the waste of a massive amount of talent. Regardless of the amount of ice time Seguin gets next season it will make headlines. Either Seguin will be making news about his growing and maturing in result of his increase in playing time, or Julien will be the one taking the heat for placing one of the leagues top forwards on the bench at a vital point in his career. I like the way Seguin plays. Iv'e been a devoted Boston fan for 40 years. He should have played a stint in the AHL like Marchand did. Not too many players have the maturity to take on the NHL coming out of Junior hockey. That being said, he proved himself in the playoffs having had time to build up his body and view a lot of video and having veteran players around him to bring him along as well. He will get more ice time as well as Caron, who spent time in the AHL this past season. I see a repeat for the talent ladened Bruins! i agree.some ahl time would have been good for him and its not tolate to send him down for a few games to work on his ice awareness and passing,but over all i grade his first year with a b+. Was too young to play in the AHL. He would have had to stayed in the OHL. That's why he was with the big club, either too high or too low league wise. Turned out fine. Problem is where do you play him? I have to say wing. Krejci is a great young playmaking first liner and Bergy is one if not thee two-way foward of the league. And that's right above Kesler and Datsyuk. Hence he has the latest ring.